Any survey of semiconductor spin coater tools and processes naturally breaks into two distinct classes of machines: those that are used in a lab environment for manual or semi-automatic operation, and those used in a full scale high volume production environment. While the fundamental physics of the spin coating process remains the same, economic concerns of automation, throughput and waste drive more of the total cost of ownership concerns of the facility manager as opposed to lab or research environments where speed and resist loss at low volumes may not be as critical a concern. 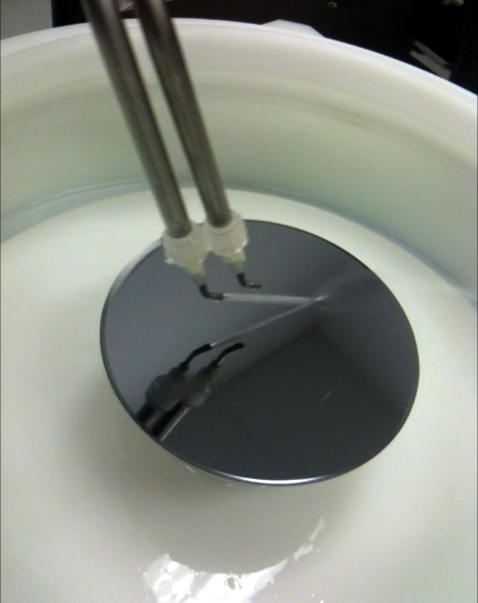 A typical spin coating process involves depositing a small quantity of a liquid polymer at the center of a substrate often while rotating at a relatively low speed and then spinning the substrate at high speed (typically around 3000 rpm). Centripetal acceleration will cause the polymer to spread to, and eventually off, the edge of the substrate leaving a thin film of polymer on the surface. 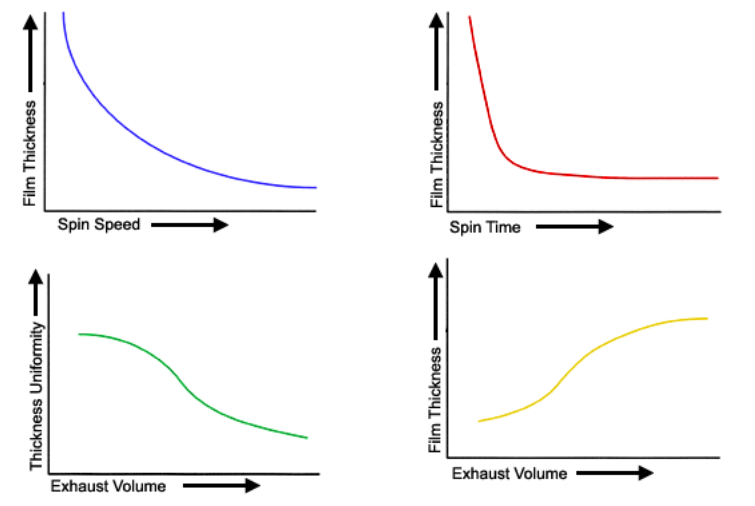 Final film thickness and other properties will depend on the nature of the polymer (viscosity, drying rate, percent solids, surface tension, etc.) and the parameters chosen for the spin process. Process parameters vary greatly for different polymer materials and substrates so there are no fixed rules for spin coat processing, and machines must retain programming flexibility to account for different wafer sizes, materials, substrates and the desired thickness of the resist. Controlling carefully the speed and acceleration of wafer spinning along with the precise application and positioning of dispense of the resist material, exhaust conditions, acceleration during the spin process is what produces the high uniformity, low waste, and speed of operation that is goal over every wafer spin coating process. The uniformity must be excellent within the wafer and wafer to wafer. Fab managers need to juggle many competing factors in their choice of spin coater-developer equipment for the fab floor. Often the lithographic cluster is composed of several machines, all with their own special wafer processing. In other cases where space and investment dollars are of more concern, lithographic processes can be integrated providing more efficiency at less cost. Either way there are a few things of primary concern to facility managers when looking at spin coating equipment for a lithographic cluster. Reliability is a function of the ruggedness of the mechanics, the robustness of the electronic components and interconnects, as well as the maturity, elegance and simplicity of the control system software. When all of these factors are combined with careful assembly, test and verification, the result is a highly reliable tool. Motors are all brushless DC type for ruggedness and reliability. Wiring is standard category 5 flexible flat cable with RJ 45 plug interconnect. Software is windows 7 based, The same software platform and database structure is used throughout the product line ensuring a high level of maturity and bug free operation. Throughput is determined by balancing and optimizing tool flow so that there are no “bottle neck” resources. In the Scene 8/12, multiple end effector robotics are used whenever a wafer is being unloaded from a process with another wafer to be loaded. Keeping “swap time” to an absolute minimum does more to ensure optimum tool balance than any other single factor. The motion speeds of the robotics need to be sustainably high but are not critical if the robot is not a limiting factor. The number of process resources required (such as spinners and thermal modules) will be a function of process times in each module balanced among the resources. All of this in a system of minimum footprint to conserve expensive clean room spaces, which often means that systems resources must be arrayed in vertical stacks wherever possible. Layout design must allow for reasonable access to maintainable subsystems so that both preventative and corrective maintenance can carried out. The use of dual end effector robots at all points in the system including at the cassette/FOUP station. Multiple robots in granular system architecture make for optimized resource balancing. Stacked and very simple thermal plates minimize footprint while at the same time boosting throughput. Additional load ports can allow the Scene 12 to process 200mm and 300mm wafers interchangeably in the same tool with no operator involvement. S3 has one of the only hot plate designs in the industry that requires no cleaning. Our self cleaning spin cup drastically reduces maintenance cycles here. Total Cost of Ownership in Production Semiconductor Spin Coating Tools. Total cost of ownership of a production spin coater tool must consider many of the previously discussed elements. Cost of operation including power and human resources required. Cost of periodic maintenance and servicing. Number of wafers processed per hour. Amount of processes integrated vs. separate machines for each. Square feet of fab space needed to operate the machine. Harder to quantify but perhaps most important is the expected reliability and stability of the equipment. Nothing is more annoying to a fab operator than a machine that “drifts” or requires constant adjustments, or is down for frequent maintenance. S-Cubed Scene 8/12 Spin Coater tools are designed from bottom up to minimize the Total Cost of Ownership. Our FastSpinTM process reduces waste on thick film resists while maintaining incredibly tight film uniformity and eliminating bubble formation during the resist application process. As many as 9 separate processes can be combined and configured reliably in our Scene 12 photoresist processing station making it one of the most space efficient production spin coating tools in the world. Our dual end effector robotics maximize wafer throughput and the exquisite servo control of our dual nozzle resist applicator present the most unique and efficient solution to photoresist dispense in the industry. Our machine is built using the concept of meta-form design. The reuse and over-design of certain components is compensated for by the standardization of parts and testing and quantity part sourcing. This makes our Scene 12/8 machines an order of magnitude more affordable than similar machines from Suss and Tel, while actually integrating more processes in a single tool. For more information on how S-Cubed is revolutionizing Spin Coaters and WLCSP tooling, contact S-Cubed Engineering today.